Pyin Oo Lwin or Pyin U Lwin (Burmese: ပြင်ဦးလွင်‌, pronounced [pjɪ̀ɴ ʔú lwɪ̀ɴ]; MLCTS=prang u: lwang mrui. ), formerly and colloquially referred to as Maymyo (မေမြို့), is a scenic hill town in Mandalay Division, Myanmar, located in the Shan Highland, some 67 kilometers (42 mi) east of Mandalay, and at an altitude of 1,070 meters (3510 ft). The town was estimated to have a population of around 255,000 in 2014. The town began as a military outpost established near a small Shan village with two dozen households  situated on the Lashio-Mandalay trail between Nawnghkio and Mandalay. In 1897, a permanent military post was established in the town and later, because of its climate, it became a hill station and the summer capital of British Burma. The establishment in Burma (civil, commercial and military) would move to Maymyo during the hot season to escape from the high heat and humidity of Rangoon. During British rule and through the 1970s, Maymyo had a large Anglo-Burmese population, but this steadily declined. During the Japanese occupation, as many Anglos were concentrated in and around Maymyo, the Japanese incarcerated many of them for fear of their loyalty to the British very close to Maymyo. Today though, Maymyo still has one of the larger hold over populations of Anglo-Burmese in the country. 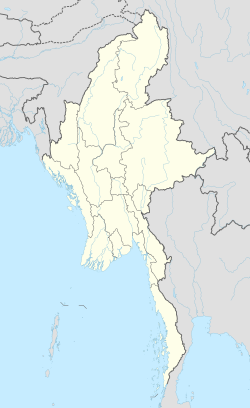 The British named the location Maymyo, literally May's Town in Burmese, after Colonel May, a veteran of the Indian Rebellion of 1857 and commander of the Bengal Regiment temporarily stationed at the location of the town in 1887. The military government of Burma renamed the town Pyin U Lwin. The town has approximately 10,000 Indian and 8,000 Gurkha inhabitants who settled in Maymyo during British rule. Today, Pyin Oo Lwin has a thriving Eurasian community, consisting mostly of Anglo-Burmese and Anglo-Indians. There is also a diverse mix of Chinese, Chin, Kachin, Karen, Shan, and myanmars and communities. It is today home to the Defence Services Academy (DSA) and the Defence Services Technological Academy (DSTA). There is a large military presence in the town. Nowaday there has some private school as Soe San, Sar Pan Eain and others. Unique horse carriages and British colonial houses make Pyin Oo Lwin stand out from the rest of the towns in Myanmar. Established in 1915, the National Botanical Gardens and the adjacent Pyin Oo Lwin Nursery are famous attractions of Pyin Oo Lwin. The beautifully created national garden and the new National Landmarks Gardens are unique. A 4-acre (16,000 m2) orchid garden is planned for 2007. Today, Pyin Oo Lwin is particularly noted for four centres of national economic importance. It is the centre of sericulture (silkworm rearing). The Sericulture Research Centre, near the National Kandawgyi Botanical Gardens, conducts three distinct roles: the intensive planting and harvesting of mulberry trees (leaves for the silk worms, bark for handmade paper), the rearing of the actual silkworms, and the reeling of the silk from the cocoons. It has a large research centre for indigenous medicinal plants. And it has one of the country's few pharmaceutical production facilities. Young Thilashin before alms round in Pyin Oo Lwin train station. Prince Taw Phaya - the oldest grandson of King Thibaw Min, the last King of Burma. ^ "Pyin Oo Lwin (District, Myanmar)". ^ a b Herbert Thirkell White (1913). A Civil Servant in Burma. London: E. Arnold. ^ Crosthwaite, Sir Charles (1912). The Pacification of Burma. Routledge, 1968. p. 31. ISBN 978-0-7146-2004-6. Retrieved 2009-02-01. Wikimedia Commons has media related to Pyin U Lwin.